We are a fully registered waste carrier. Our clients include national companies, small builders, local authorities and domestic customers alike. Grab Lorries can be a much more efficient way of removing waste from site. Our eight wheel Grab lorries can carry up to 15 tons of material this is the equivalent of two builders skips of materials in one load which offer our customers far greater value for money. About Grab Hire is Scotland's leading grab hire company. 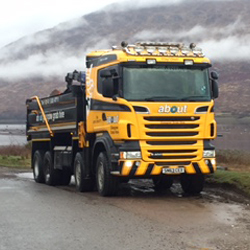 Supplying the needs of builders construction companies landscapers and utilities companies all over Scotland.